I love traveling the world, especially with my family. One of my favorite countries we have been to is the small island of Ireland. Ireland’s weather is much different than other countries surrounding it. It stays at a mild 50°F, with lots of daily rain showers. If you’re planning a trip, be sure to pack your raincoat and boots to keep dry. I’ve created a list of what to do while you’re here. If you’re a history buff like me, you’ll want to see as many castles as you can during your stay in Ireland. Visit the Blarney Castle to kiss the stone and be granted the “gift of gab” or hop around St. Patrick’s Rock at the Rock of Cashel to find love in the next year. The towns of Killarney and Kilkenny also have incredible castles and self-guiding tours. Make your plans to see these iconic locations early in the day to beat the crowds. You’re also going to want to consider spending a few extra Euros to get a tour guide for the day. There’s nothing like hearing the history from a true Irishman. The west coast of Ireland has so much natural beauty to offer. If you’re comfortable driving here (remember, they drive on the opposite side of the road, as well as the opposite side of the car! 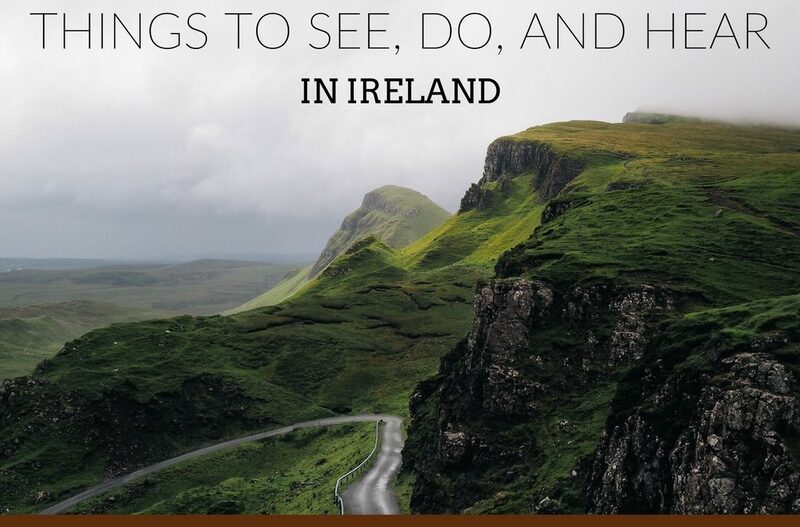 ), take a road trip around the Ring of Kerry. This 8-hour drive around the peninsula will have sights that will take your breath away. You’ll drive through the Killarney National Park and feel like you’re in a fairytale. After you’ve finished this tour, head north to the famous Cliffs of Moher. Plan to spend most of your day here as it takes at least two hours to hike from one side of the cliffs to the other. If the day you plan to go has too much fog, spend the night in the little town of Doolin just ten minutes away and try again the next day. I promise the wait for a clear day will be worth your stay! Ireland is known for their beer. If you find yourself in Kilkenny, taking a tour of the Smithwick’s brewery is a must. Their upbeat tour guides and moving portraits will keep the whole family entertained. And a little fun fact that only the locals will tell you: it’s pronounced “smid-icks.” The other must-see brewery is the Guinness Storehouse. This 7-story tour takes you through the process of how they make their beer, their long-standing history, teaches you how to properly pour a pint of Guinness, and ends with a 360° view of Dublin at the top floor. This is another attraction that you should arrive at early if you wish to beat the crowds.